Life.... goes on day after day. Hearts.. torn in every way. Peo.... ple they rush everywhere. Each... with their own secret care. And always take me there..the place I love. They seem to smile and say..
We'll never turn you away. Here.... I always will stay. So ferry across the Mersey. Cause this land's the place I love..
And here I'll stay......and here I'll stay.. Here I'll stay. Here I'll stay. 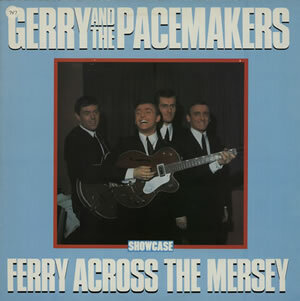 "Ferry Cross the Mersey" (sometimes written Ferry 'Cross the Mersey) is a song written by Gerry Marsden. It was first recorded by his band Gerry and the Pacemakers and released in late 1964 in the UK and in 1965 in the United States. It was a hit on both sides of the Atlantic, reaching number six in the United States and number eight in the UK. The song is from the film of the same name and was released on its soundtrack album.